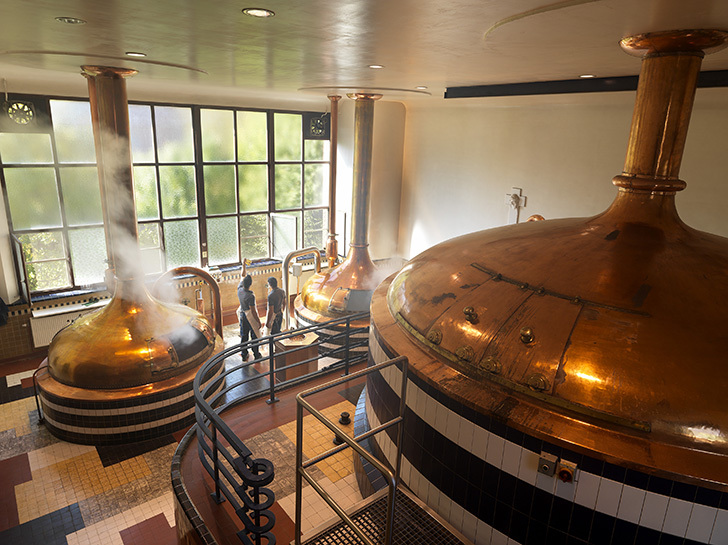 Tripel, a strong pale ale, fits into a larger category of Trappist-style Belgian ales. Light in color, well-balanced in terms of malts and hops, and usually made from Belgian yeast strains, some tripels are considered among the best beers in the world. The name "Tripel" actually stems from part of the brewing process, in which brewers use up to three times the amount of malt than a standard Trappist "simple" beer. Traditionally, Tripels are bright yellow to gold in colour, a shade or two darker than the average Pilsner. Head should be big, dense and creamy. Aroma and flavour runs along complex, spicy phenolic, powdery yeast, fruity/estery with a sweet finish. Sweetness comes from both the pale malts and the higher alcohol. Bitterness can be up there for a beer with such a light body for its strength, but at times is barely perceived amongst the even balance of malts and hops. The lighter body comes from the use of simple sugars (up to 25% sucrose), which not only lightens the body, but also adds complex alcoholic aromas and flavors. Small amounts of spices are sometimes added as well. The brewery must be controlled by the monastery and have a business culture compatible with the monastic project (a religious way of life in which one renounces worldly pursuits to devote oneself fully to spiritual work). There are currently only 11 monasteries in the world producing what can officially be called "Trappist" beer. Westmalle Brewery (official name: Brouwerij der Trappisten van Westmalle) is one of six located in Belgium. 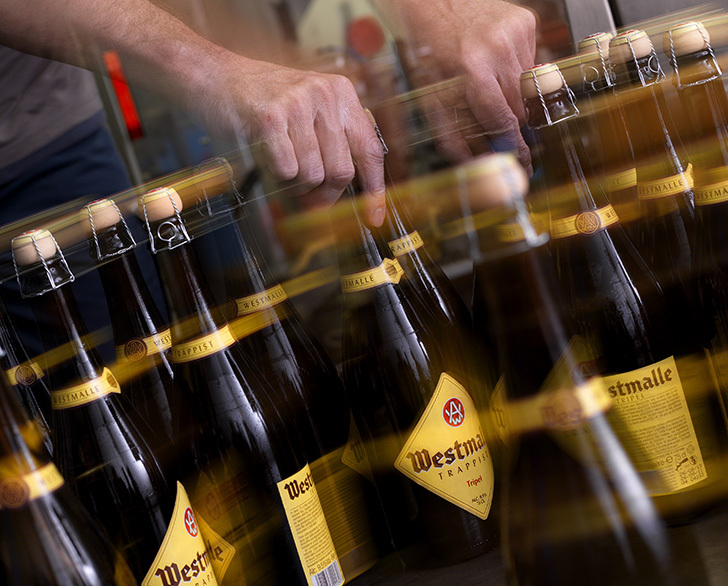 For more than 200 years the Westmalle Trappists have chosen a life of prayer and work. True to the Rule of Saint Benedict, they ensure their own means of sustenance. To accomplish this there is a farm, a cheese dairy, and a brewery inside the walls of the abbey. These three things are deliberately kept to a small scale, and particular care is taken on the impact to people and the environment. 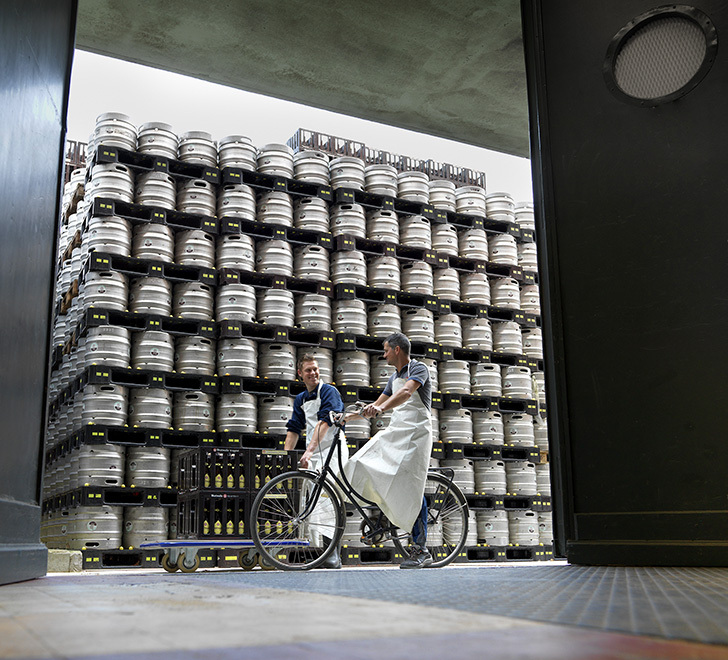 The brewery’s income is used to make the necessary investments and changes in line with developments in brewing technology, to support Trappist communities, and to carry out charity work. Profit is not their motive. 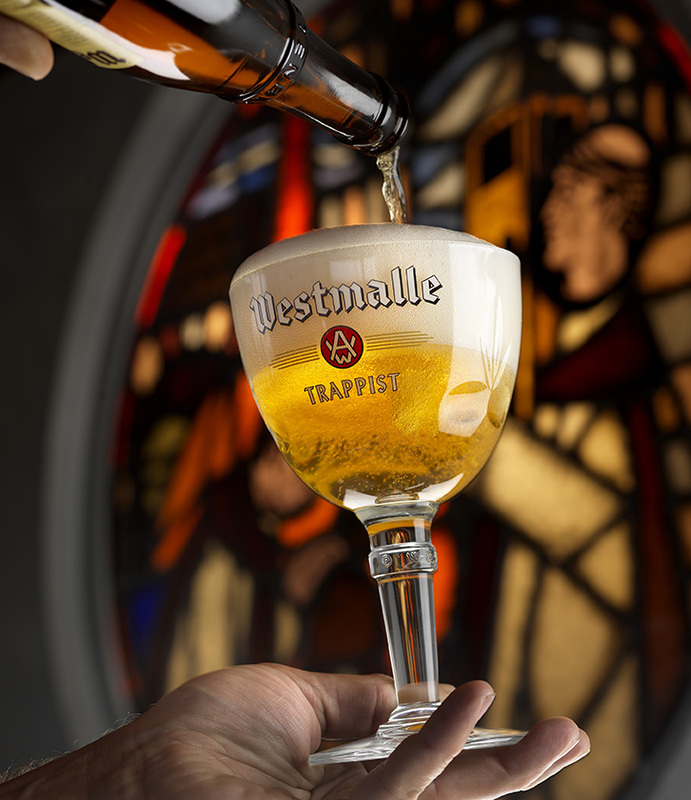 The Abbey of Westmalle was founded in 1794 and beer production began four decades later. On the 10th of December 1836 they served their first brew of Trappist beer at lunch. Since then the monks have been able to drink beer (the region's popular beverage) with their meals. In 1934, nearly 100 years since beer production had started, the brewery was the world's first to brew a strong pale ale of 9.5% ABV giving it the name Tripel - the first modern use of the name. The current formula has stayed practically unchanged since 1956. It is the beer that inspired our recipe. "This beer enjoys considerable prestige among the public and among brewers. Strongly alcoholic, blond top-fermentation beers are not infrequently given the ‘tripel’ epithet, which means no less than the best in the series. The Westmalle Tripel can also be called the mother of all tripels without false modesty - a world classic thus. In the glass, the tripel has a warm golden blond colour. The surprising fine and abundant bubbles are reminiscent of champagne (this beer is also given the pet name of the champagne of the Campine). The head is white, fine, creamy and abundant, and after a few sips it leaves behind a fine lace pattern on the glass. The tripel is a complex beer: in the aroma, fruitiness (overripe banana), fine hop bitterness and soft maltiness fight for attention. The flavour range is just as complex: the beer feels creamy in the mouth, delicately sweet without coming across as sticky, and also fruity with a bitter orange taste. The aftertaste is long, dry and pleasantly bitter. 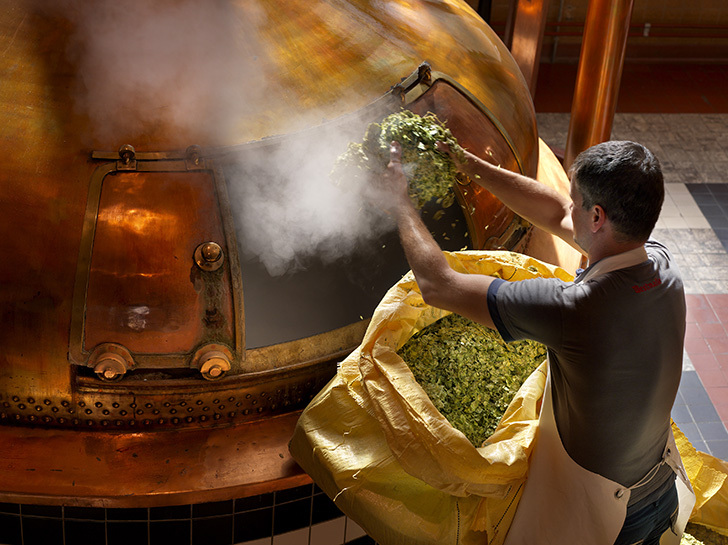 Its hop character gives the beer an appetising nature." Trappist breweries conjures up images of monks brewing by candlelight with very little in the means of modern technologies but that is not always the case. At the Abbey of Westmalle the bottling plant was modernised in 1956, and in 1968 a separate water treatment plant was brought online. By 1991 the brewing hall was completely computer-controlled. If it improves quality, then the Trappist monks are more than happy to use new technologies. Who knows, they may even be using our electric brewery design for pilot/test batches! Higher-alcohol beers like Westmalle Tripel are brewed with a rather aggressive and alcohol-tolerant strain of Belgian yeast that's famous for producing very smooth, drinkable beers that are both flavourful and boozy. Fortunate for homebrewers, the actual Westmalle yeast is available as White Labs WLP530 Abbey Ale or Wyeast 3787 Trappist High Gravity. This yeast is less fruity and spicy than some other Belgian strains and more alcohol tolerant (up to whopping 15% ABV). Expect fruit flavours (plum, raisins, pear, and apple) that are subdued enough to allow the subtle pilsner malt flavours to come through. Fermentation schedule and temperature plays an important role in creating a perfect Belgian with this yeast so heed the instructions here. Good temperature control will keep the high alcohol from tasting too solventy and control the spicy phenols and fruity esters from overpowering. Given the true top cropping (fermenting) nature of the yeast, make sure to have a good 20-30% of headspace in your fermenter. A blow-off tube is recommended. 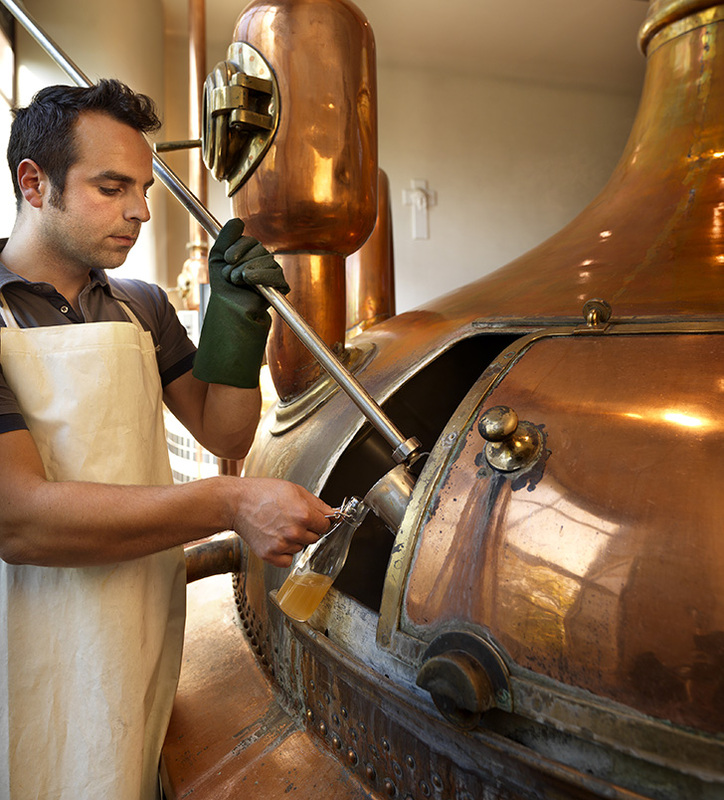 To achieve proper attenuation, part of the malt bill is replaced with simple sugars that ferment out completely. For this lighter coloured and flavoured beer, plain table sugar works well as the goal is simply to make a more fermentable wort, not add flavour. Clear Belgian candi syrups are also available for this purpose, but like many brewers I don't find they offer any advantages over something like plain table sugar. Darker Belgian candi sugars are a completely different story however as they add specialized flavours (similar to crystal malts). This beer is deceptively smooth so be careful: It's very easy to forget that it is over 9% ABV until you start to get closer to the end of your first pour. This is definitely a sipping beer. Tripel's a style I find can be consumed both fresh (after only a few weeks of lagering/cold conditioning) and after longer term cellaring (aging for many months). It's interesting to taste how the beer changes over time. For a more "authentic" taste similar to the commercial version, age the beer for a few months to mimic import and distribution times. Try the beer over time and see what you think. For serving, it's best to use a Trappist goblet or chalice (see picture at top). This does full justice to the complex character of the beer and allows room for the rich head. Like any other pour, ensure that the glass is free of any detergents or grease as either will cause the foam to immediately disappear. For those that like to bottle, it is best to keep the beer in a dark place at a constant temperature somewhere between 46-56F once carbonated. Before serving, let the bottle rest cold for at least a week so that the yeast sinks to the bottom and you will get a nice clear pour. The beer should be brilliantly clear, not cloudy. When pouring, hold the glass at an angle and begin pouring slowly along the side. Continue pouring in one movement and hold the glass vertically at the end in order to end in the middle, producing a perfect head. Leave around half an inch of beer in the bottle. This yeast base (rich in vitamin B) should be consumed separately. I first brewed this on December 7, 2015 (batch #194). Brew up a batch and let me know how you like it! *Can't find Belgian Pilsner malt? German Pilsner malt will make an excellent Tripel as well. Start the mash at 131F for 10 mins (high end of the protein rest range). Ramp up to 149F and hold for 90 mins (beta rest). If your system does not allow for step mashes, try a single infusion mash at 150F for 90 mins, followed by a mashout to 168F for 10 mins (if possible). Cool wort to 62F and aerate well. Pure oxygen from a tank can help with high gravity beers like this and is highly recommended. Pitch yeast and start fermentation at 64F, allowing temperature to rise to 70F over one week (raise 1 degree per day). Allow yeast to continue until finished. Do not allow temperature to drop. If yeast seems to be stalling, do not be afraid to raise temperature as high as 75F to ensure proper attenuation. Assume fermentation is done if the gravity does not change over ~3 days. Package as you would normally. Though some will argue that a Tripel should only be bottled, if I still had to bottle I wouldn't be brewing beer. So I keg and then force carbonate. This beer should be served at higher than normal carbonation, around 2.5 to 3.5 volumes of C02. The beer will improve greatly if kept near freezing for 4 weeks before serving and will continue to change over time. Sampling is recommended. I use a lagering/conditioning fridge that holds 6 kegs, set to just above freezing that holds a small 5 pound CO2 tank so that the kegs can condition/lager and carbonate at the same time. I'm so glad you added a Trappist style beer to your list. Every recipe of yours that I have tried has come out great. I'm looking forward to this one. The real beer I'm looking for is a strong dark like Chimay or Abt 12. You ever consider refermentation/conditioning in the keg? I've done it a few times and it came out great, especially high gravity beers. For example with this recipe: when I rack to the kegs I'd add 1/4 lb of sugar in water to each keg and fresh yeast. I'll put it up stairs in the laundry room for a 3 weeks, then I'd lager it. I know carbonation is carbonation, but I think this process really helps it age better. Either way, I'll be making this soon. I'm so glad you added a Trappist style beer to your list. Thanks! I've actually never been a huge fan of Belgian beers in general, but that's probably because I've had some questionable ones in the past which made me steer away. Now that this beer has carbed and is in its prime, I can see what all the fuss is about! It's absolutely fantastic. Recipe wise it's a very simple beer but this yeast has added some much depth and complexity. Not a 'heavy' beer or 'weird' beer if that makes any sense. If a beer can be simple but complex at the same time, this is it. I find you get different flavours from every sip as you think about it and as the beer warms up. Anyone that has good temperature control for fermenting should be able to make a great Tripel like this as it's fairly straight forward. I haven't, but sounds interesting. Even the monks don't keg this beer - it's bottled only and if you read their information on it on the website they do mention that it undergoes a secondary fermentation in the bottle which changes the flavour. I'm sticking to kegging however. I really, truly, hate everything to do with bottling. Let us know how your brew day goes - good luck! Which of the malt types used do you find to be "under modified" since you choose to use STEP mash for this beer? As far as I have read, all of the used malts in this recipe are modified so step mash shouldn't be required? Am I missing something? Bad video. The beer looks hazy and dark but it isn't. It's brilliantly clear when you hold it up to the light. The other two steps hit the beta and alpha ranges to maximize fermentability. Then there's the usual mashout. I always struggle with steps and the logic/science behind it and frankly was just going to publish this as a single infusion mash because I doubt what I did made a huge difference (if any) but figured I really should publish what I did for sake of accuracy. I should have actually kept better notes as to the why's behind this and posted them here too. I remember doing a lot of research on this. http://braukaiser.com/ has a ton of great info and is a good place to start. There's varying opinions on the subject but he (Kai) used to believe that separate beta and alpha rest help lock in a fermentability profile. I think he's mostly gone to single infusion mashes now. So opinions change over time too. YMMV. Definitely an area of brewing where there's room to experiment and the science doesn't seem to be 100% understood. Hopefully some others will chime in with their thoughts/experiences. Man, was I excited to see you post a recipe for Tripel, Kal! I've been contemplating brewing a this style, and recently finished reading Stan Hieronymus's "Brew Like a Monk," which is a great resource about the history, concepts, and brewing tips for the Trappist style ales. I had started putting together a recipe when I received your email stating that you had a recipe in hand. Talk about good timing! I've purchased and received the ingredients for this beer, and plan on brewing it this weekend. I'll blog my process/results on Facebook ( https://www.facebook.com/PineGroveBrewWorks/ ) and let you know how it turns out! By the way, I brewed the Hopslam clone again... as always, amazing. Thanks again for all of the excellent work you do for the brewing community! Question about the weight of the Melanoidin Malt. Is it 7 pounds or 7 ounces? Both units are shown. Definitely 7 oz. Sorry for the confusion. I fixed the recipe. I finally got around to brewing this beer. It's actually christened my single barrel system but I only brewed 20 gal. I figured I'll fill a keg then bottle 4 or 5 gallons. It all came off without a hitch with exception of the gravity. I hit 1.080. A little off but I guess I can live with it. I'm looking forward to tasting this beer in a couple months. So after a single week fermentation I find my gravity at 1.012 already. I was expecting a slower ferment with a higher alcohol percentage and my using the WLP500. This was all that was available at my LHBS. This was the first gravity reading but it appears to have neared its goal already. I'll take another in a couple days. I'm considering 1.010 as a completed ferment however if it keeps dropping should I just go with it or should I finally go ahead and crash chill? In not using a secondary, I plan to just crash chill in the conical. Does this sound ok? You should let it ferment to completion. Thanks for the recipe Kal. Although I had my first bit of trouble with this one on the system (identical to yours) - the mash kept packing down and slowing the recirculation to a crawl - was impossible to step mash without stirring several times. Could be the higher grain bill? Had the same mill setting with your Weizen and Blonde Ale. Recirc was open full on both of those with no issues. Added a bit more water to this one to thin the mash, think the water weight could have added to packing it down so much and restricting flow? Thanks for the recipe Kal. Although I had my first bit of trouble with this one on the system (identical to yours) - the mash kept packing down and slowing the recirculation to a crawl - was impossible to step mash without stirring several times. Could be the higher grain bill? No - if your setup is truly identical then you likely milled too fine. Try a bit looser next time. If you have difficulties with grain compaction you can also try opening up the MLT pump valve slowly over a minute or so after you first mash in instead of opening fast. That can help on some setups. Will try both next batch, thanks for the feedback. We got through it though - bubbling away at 65 currently (day2). Had a good time. But I clearly didn't do the math and add up all the time for the extra mash, started a bit late, so ran into a time crunch at the end of the day. Regardless, I have an OG of 1.082 and just pitched a 4L Starter at 64* F. I plan on increasing one degree per day as suggested. Can't wait to try this. Thanks for all the awesome information on this site. I am just beginning to be comfortable with my electronic brewery thanks to you! Glad to hear it's working out NathanDH! You're only a couple of points below the target gravity so that won't really be noticed. Enjoy the beer and welcome to the forum!